Sign up and receive Property Email Alerts of Farms for sale in Rietfontein A H, Rustenburg. 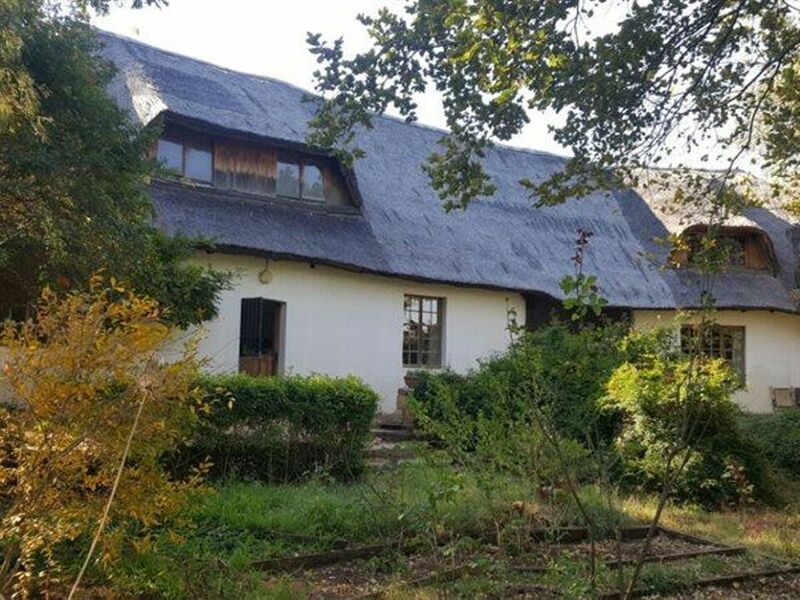 This 26.25 HA bushveld farm is located near Sparkling Waters in the Rietfontien area. the land is naturally terraced on a south eastern slope with views down the valley and 800 meters of river frontage, (Sterkstroom). The farm is fenced with cattle fencing with one boundary on the river. There are four camps which can be used as grazing for cattle. The thatched roof house gives an atmosphere of warmth and nostalgia to the property. Lovely green gardens invite you to spend time outside in nature with over 20 fruit trees and an established vegetable garden. the property offers a spacious 4 bedroom house, a rondavel consisting of one bedroom, living area, kitchen area and bathroom. A 2 room red brick workers house, 18 x 6 m workshop / storeroom, pump house, with old large Peter generator, 1 strong borehole with 2 tanks and one smaller borehole that is not used and 3 phase electricity. A large swimming pool used as water reservoir. There are lots of fruit trees consisting of limes, lemons, oranges, naartjies, grapefruit, peach, plum, prune, apples, avo''s, bananas, almonds, pomegranates, figs, kumquarts, guava, walnut, olives, grapes both green and red, blackberries, and raspberries as well as lots of herbs. The property is registered as a CC and is VAT registered which is included in the price of R2 500 000. Contact Corrie or Deon to view this property. Sign-up and receive Property Email Alerts of Farms for sale in Rietfontein A H, Rustenburg.